The percentage of Americans saying there is solid evidence of global warming has steadily increased over the past few years. Currently, 67% say there is solid evidence that the earth’s average temperature has been getting warmer over the past few decades, up four points since last year and 10 points since 2009. Similarly, an increasing proportion say that the rise in the earth’s temperature has mostly been caused by human activity. Currently, 42% say the warming is mostly caused by human activity, such as burning fossil fuels, while 19% say it is mostly caused by natural patterns in the earth’s environment. Last year, 38% mostly attributed global warming to human activity and in 2010 34% did so. The national survey by the Pew Research Center for the People & the Press, conducted Oct. 4-7 among 1,511 adults finds increasing numbers of Democrats, Republicans and independents saying there is solid evidence of warming, although there continues to be a substantial partisan divide on this issue. Fully 85% of Democrats say there is solid evidence that the average temperature has been getting warmer, up from 77% last year and similar to levels in 2007 and 2008. Nearly half of Republicans (48%) say there is solid evidence of warming, compared with 43% last year and 35% in 2009. The percentage of Republicans saying there is solid evidence of warming is still lower than it was in 2006 and 2007, but is now about where it was in 2008. A majority of independents (65%) say there is solid evidence of warming; that is up from 53% in 2009 and lower than from 2006 to 2008. A majority of moderate and liberal Republicans (58%) say there is solid evidence of warming, including 38% who say it is mostly due to human activity. 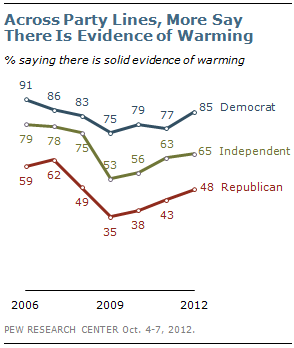 By contrast, only 43% of conservative Republicans say there is evidence of warming, while 51% say there is not. 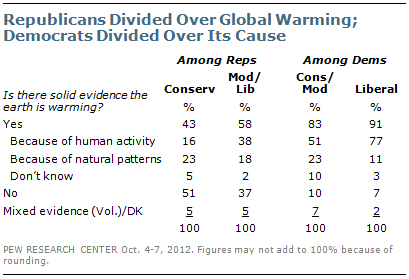 However, more conservative Republicans say there is evidence of warming than did so last year. In 2011, just 31% said the earth has been warming while 60% said there was no solid evidence of warming. Large majorities of both conservative and moderate Democrats (83%) and liberal Democrats (91%) think there is solid evidence of warming. But liberal Democrats are more likely to say that warming is mostly because of human activity – 77% say this, compared with 51% of conservative and moderate Democrats. The percentage of liberal Democrats saying warming is mostly caused by human activity increased 13 points from 64% last year. The public continues to be divided on the question of whether scientists agree that the earth is warming mostly because of human activity; 45% say scientists agree while 43% say they do not. This is little changed from 2010. In 2006, far more said that scientists agree (59%) than disagree (29%) that the earth is warming mostly because of human activity. There is a wide partisan divide over the question of scientific consensus: Just 30% of Republicans think scientists agree, compared with 58% of Democrats. Independents, like the public overall, are divided. Many continue to see global warming as a problem; 64% of Americans say it is a very serious (39%) or somewhat serious (25%) problem. That is virtually unchanged from last year and still lower than from 2006 to 2008. 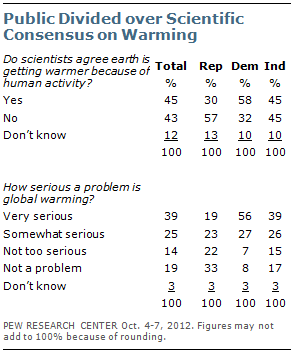 A majority of Democrats (56%) say that global warming is a very serious problem. By contrast, just 19% of Republicans think it is a very serious problem while the majority (55%) says it is not too serious or not a problem at all. 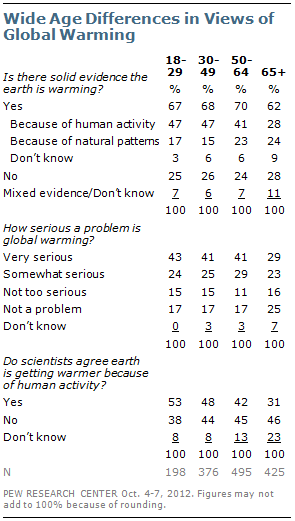 Among independents, 39% say that global warming is a very serious problem. A majority across all age groups say there is solid evidence that the average temperature on earth is warming. However, those 65 and older are far less likely to think that warming is mostly because of human activity – just 28% say this, compared with 47% of those under 50. Similarly, just 29% of people 65 and older say that global warming is a very serious problem That compares with about four-in-ten in other age groups. On views about scientific consensus, the age differences are even greater. A majority of those under 30 (53%) say that scientists generally agree the earth is getting warmer because of human activity. By contrast, a plurality of seniors (46%) say scientists generally disagree while just 31% say they agree. Those ages 30 to 64 are divided in whether they think scientists generally agree or disagree about global warming. Fully 88% of voters who support Barack Obama say there is solid evidence that the average temperature on earth has been increasing over the past few decades while just 8% say there is not. 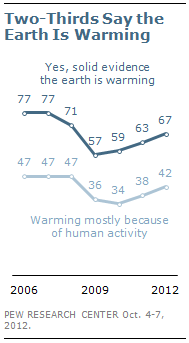 And 63% say that the warming is mostly because of human activity. By contrast, just 42% of Mitt Romney supporters say there is solid evidence of warming while as many (49%) say there is not. 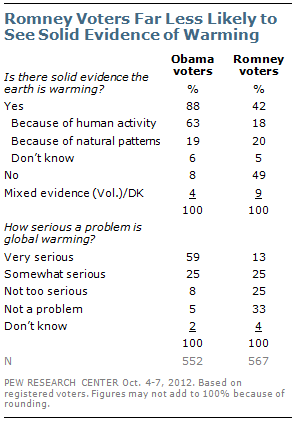 Just 18% of Romney supporters think the earth is warming mostly because of human activity. Obama supporters also are far more likely than Romney supporters to say global warming is a very serious problem (59% vs. 13%). Fully 58% of Romney supports say it is not too serious or not a problem.